Not Going Anywhere For Spring Break, Don’t Worry! For some of you, Spring Break has already begun. For those few of you that are waiting for that one class to be over…don’t worry it will be over before you know it! Spring Break always goes by too fast for my liking anyway. Our last Spring Break blog post this week is something that I have a bit of an expertise in. If you are a part of the crowd who is not going on a traditional Spring Break vacation, this is the blog post for you! It is possible to have fun while relaxing at home and I’m going to give you some ideas to help! Reconnect with high school friends. It’s easy to become distant when going to different colleges all over the state or even nation. Your high school friends spent many Friday nights watching football games, Saturdays hanging out at the mall (never actually buying anything) and watching movies in basements with you. It’s time to do all that stuff again! Netflix. I am a HUGE fan of Netflix. I know I am not the only one out there that loves it as well. Try out a new TV series or watch that documentary you were meaning to check out. On their website, they have a running deal to try a month for free. The best part? No, waiting a week for the next episode, you have whole seasons of TV series available. Don’t worry no one will judge you for watching the entire season in one sitting. Visit a city nearby. Make a day trip to one of your favorite cities with a friend. One Spring Break, a friend and I drove to Chicago. We went shopping, had dinner and (later) found out it was St. Patrick’s Day. It was a cheap trip but we had as much fun as if we paid $1000 dollars. Read those books you have sitting on your desk. Reading for fun is hard to do when you have assigned readings in almost every class. The words begin to blur and by the time you’re finished, reading a book for fun no longer sounds like a good idea. Relax, you’re on Spring Break remember? No assigned readings! Recharge. Spring Break is just that, a break for students in their Spring semester to take some time to relax. Use this week to your full advantage. Sleep-in, eat some home cooked food and visit with family and friends. The most important part of Spring Break is to do somethings for yourself. This is your time! 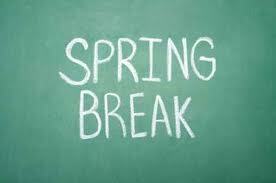 Have a wonderful (and safe) Spring Break! We’ll miss you! Previous PostStaying Healthy on Spring Break…Next PostWhat’s After This Week?